Maybe it is the fresh new air of the new year or the short lived enthusiasm of new year resolutions, whatever it is I took down all my Christmas decor (got to note only the ones I hung aka. inside the home, outside lights are B’s territory ;)) and put it safely away. One thing different about this year’s cleaning up process was that I put some thought into it even before I started, gathered my stuff up, and was done in no time. Ok, granted I don’t go all out for Christmas but clearing up the tree itself used to take days. This time it was a breeze. I tell ya, you too can claim your home back with some planning. The golden rule of a DIY’er – Never throw away a shoe box. Grab every one of them you can find around the house. I take this rule a step further and save even the boxes that my recessed light bulbs came in. 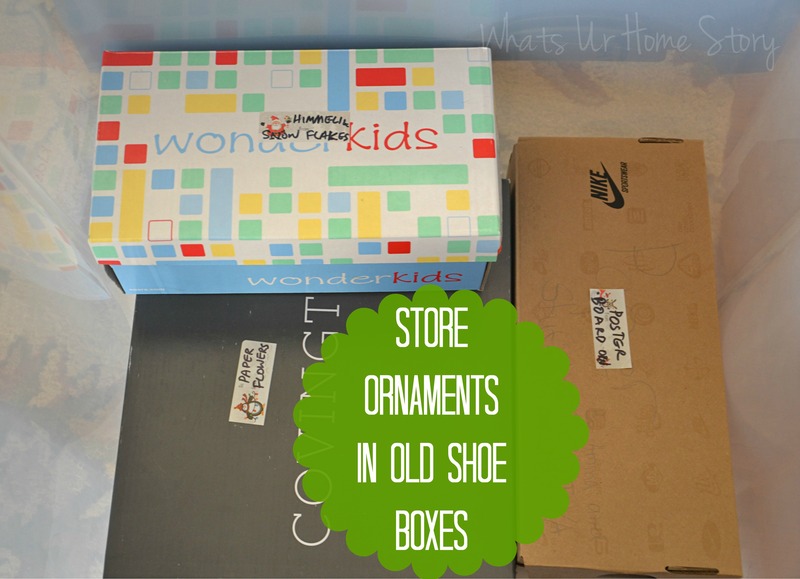 They are perfect for storing those odd shaped fragile ornaments. The usual culprits; ornament storage boxes, clear plastic bins, Ziploc bags. Labels -any kind would do. I use the free ones that come in my mail. For the round ball breakable ornaments, I usually save the boxes that these came in and return them back to their boxes during pack up time. Didn’t have this issue this time as my tree only had all handmade natural ornaments. So the ornament pool was split into boxes of pine cones, poster board ornaments, Himmelis, Egg Carton ornaments, paper swirls, mirror ornaments etc. Sorting them based on type will prevent any breaking or bending. Sorting by color is gonna make your life easier next year when you want to decorate the house all over again. 2. 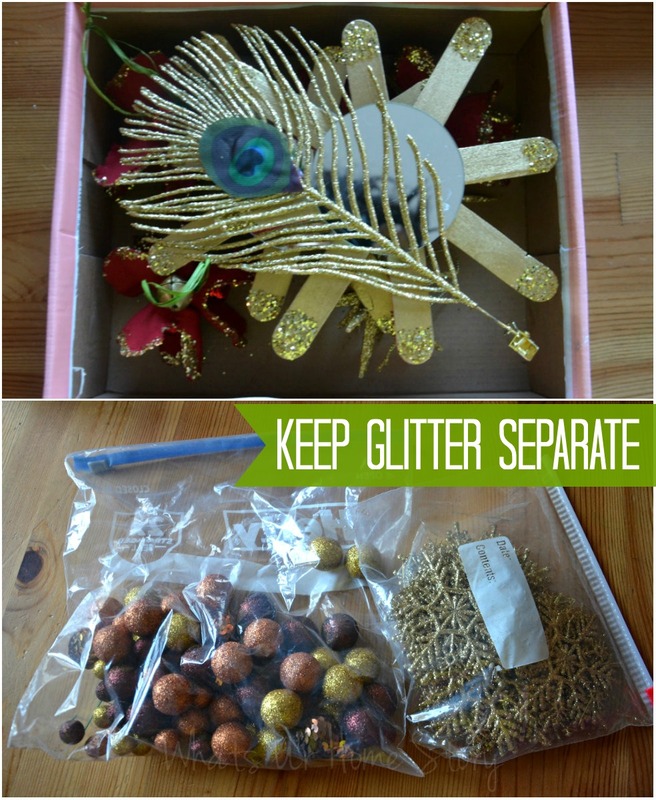 Keep the glitter stuff, candles, ribbons, and breakables separate. All store bought glitter stuff shed like crazy. Storing them with non glitter decor ensures that your non glitter ornaments will be covered in glitter next year. So I store them separately in Ziploc bags. Same goes for Christmas candles. They get their own box where I tuck each individual candle in a bed of ribbon and tinsel garland so as to prevent scratches from other ornaments with sharp edges. 3. Label every box as descriptively as you can. 4. 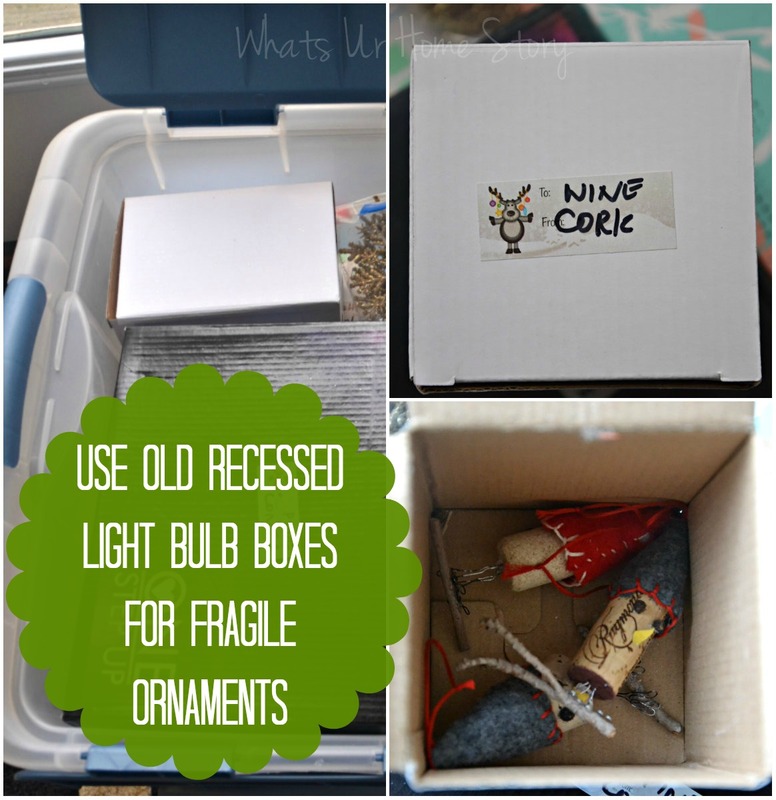 For storing those odd shaped fragile ornaments old recessed light bulb boxes are the best. Case in point my wine cork ornaments. 5. 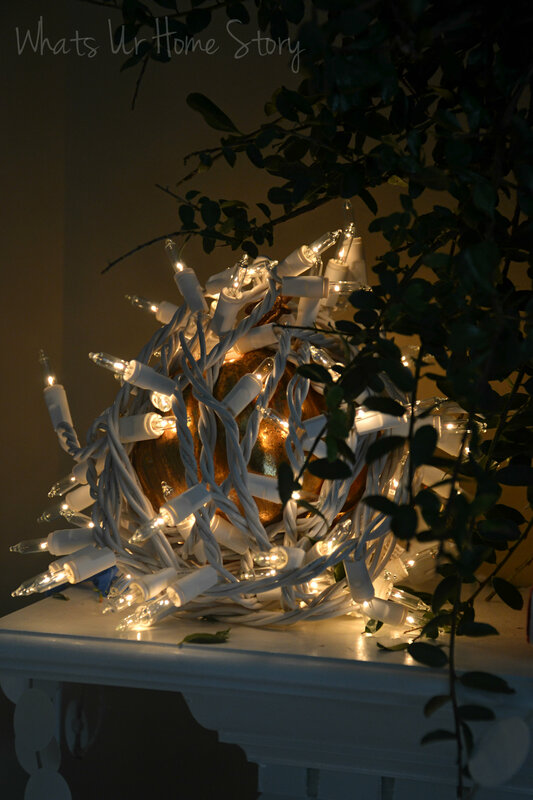 Cardboard is your buddy when it comes to Christmas tree lights. Put those gift boxes to good use. 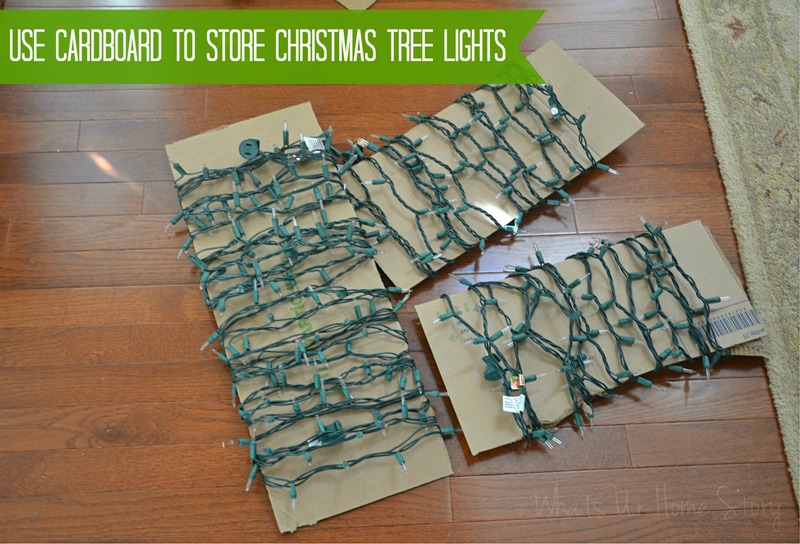 Cut a large enough piece (just guesstimate) and wrap your Christmas tree lights around it. Keeps them from tangling and saves you all that untangling heart ache come next holiday season. 6. Recycle more of the gift packaging. If you were lucky enough to receive a tall gift like this Karaoke machine that my daughter got, save the carton! All my tree lights fit into that one box! Yay! All snug inside and labelled. I’m all set for next year. Storing your holiday decor in clear plastic bins makes it for easier spotting when you want them again. 8. 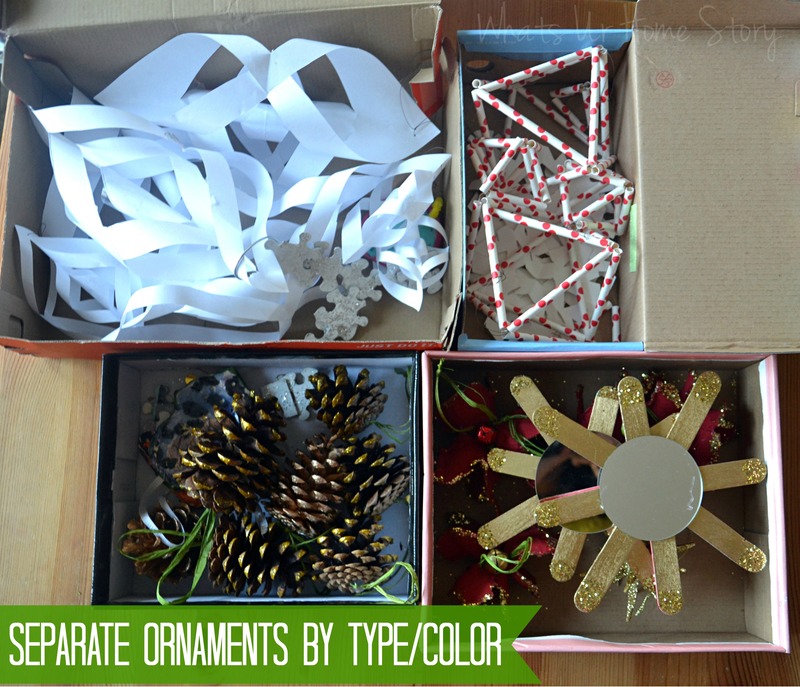 Use left over holiday ribbon to tie and label hanging garlands. I don’t have any hanging garland but if you do then fold and wrap it around itself and secure with a piece of ribbon. On the ribbon label what place the garland belongs to; mantel, stairs, outdoors etc. You don’t have to pack all your holiday stuff away at once. Sift through your stuff, I’m sure you’ll find many wintry items that you can use on your winter mantel or just around the house in winter. My poster board garland, some of the lights now dress up my winter mantel. More on that later in the week but for those of you wondering here’s a sneak peek. 10. 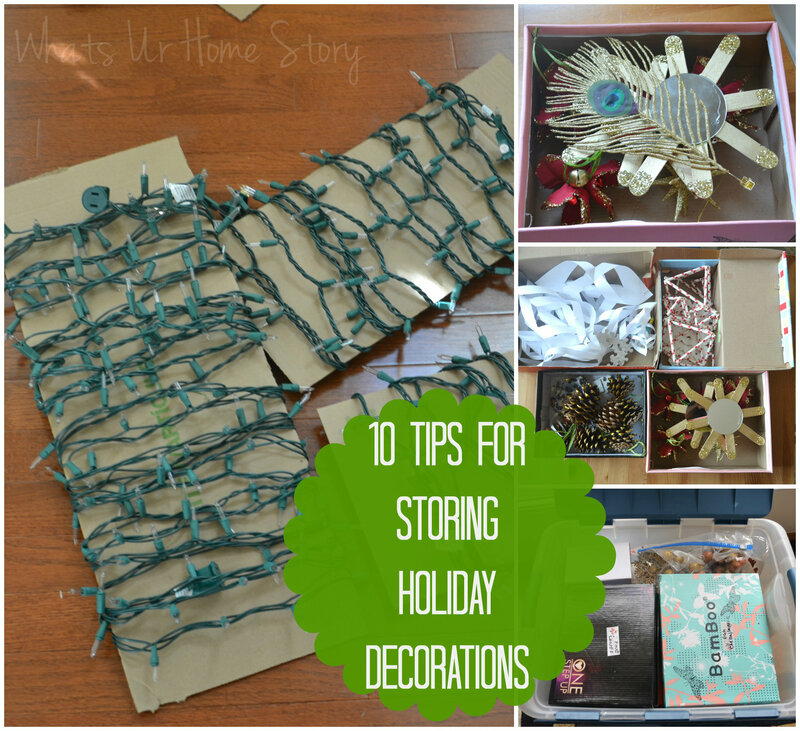 When storing away many boxes store the items you’ll need last next year first. For e.g. you’ll need the tree stand before the ornaments next year. 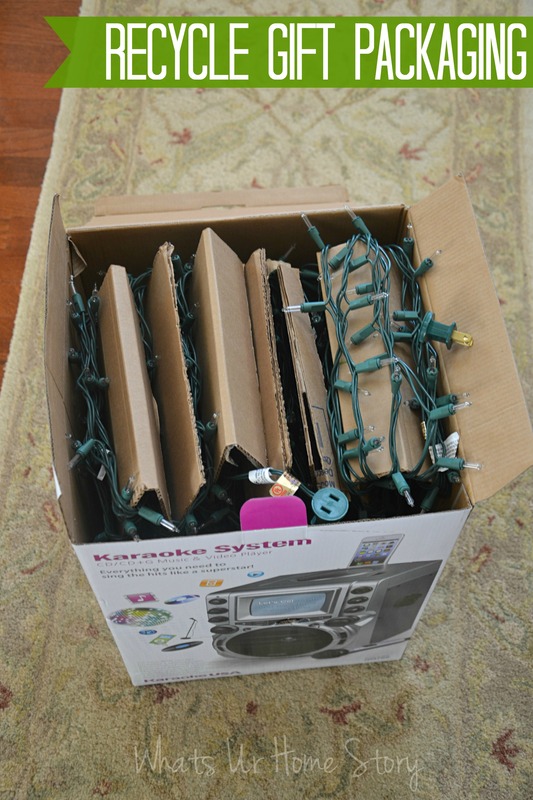 So store your tree stand box in such a way that you can access it first next time, followed by your ornament boxes. You wouldn’t need the stockings until later so that box would most likely be the last one to come out, hence the first on to go in. See ya tomorrow! Have you packed away your Christmas decorations? Looking for Christmas decorating ideas? Don’t forget to checkout these posts…..
Holiday Entertaining + A Nestle Giveaway! Clay State Ornaments & A Linky Party! Nice job Vidya. It really is a lot of work but worth it. Saving the shoe box is the best tip. I use them a lot too. Thanks Reshma. Yes, I use shoe boxes around the house a lot too for storage. It seems every year i use less, but need more space…thanks for the tips!!! So true SSP! Cannot have enough space ever! You are welcome. How did you know I needed some help organizing my holiday stuff? 😉 This will definitely come in handy! 🙂 Glad I could help. Next year my husband is planning to get a real tree, so will have 2 tress to decorate. Hopefully all this organizing will save the day then!